Fr Ken Barker MGL wants to set the world on fire and he wants you to help him. But before you reach for the matches, you should know the flame he wants to grow comes from a personal encounter with God. Source: The Catholic Leader. 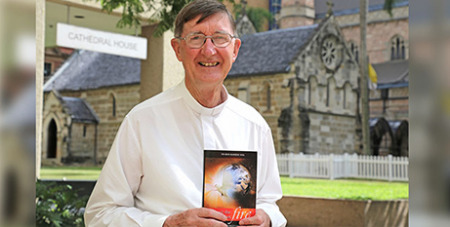 Fr Barker’s new book Go Set the World on Fire was officially launched by retired Bishop Brian Finnigan at Camp Hill parish in Brisbane on February 24. Fr Barker said everyone had been talking about evangelisation lately and thought he would give his own pitch. He joked the 200-page book was, in a way, his submission to the Plenary Council 2020. Fr Barker is the leader of the emerging congregation Missionaries of God’s Love and places a strong emphasis on just that – God’s love. He said he wanted to place a relationship with Jesus Christ front and centre. “Many Catholics have been catechised, taught things in the Catholic school system, and they’ve been sacramentalised, had sacramental experience, which is all very good, but maybe not evangelised,” he said. As for why people hadn’t come to that encounter yet, Fr Barker said formalism and routine often got in the way. “One reason is while people may have a Catholic sense of identity through upbringing but, for one reason or another, not yet in their personal life come to an encounter with Jesus in a really living way,” he said.